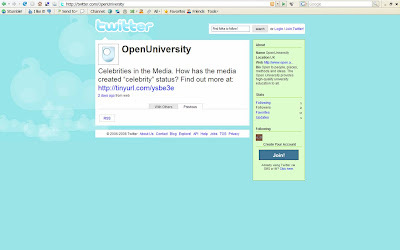 OU and Telegraph use video, Twitter, newspaper and web to promote OU courses! 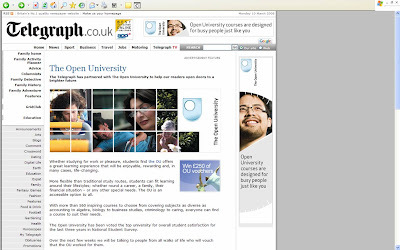 The Daily Telegraph have launched a range of activity with the Open University to promote further learning. A variety of innovative activity includes web, newspaper and video executions - there is even a mobile angle as readers can engage with the OU through Twitter! "The OU offers a great learning experience that will be enjoyable, rewarding and, in many cases, life-changing. More flexible than traditional study routes, students can fit learning around their lifestyles; whether round a career, a family, their financial situation – or any other special needs. The OU is an accessible option to all. With more than 560 inspiring courses to choose from covering subjects as diverse as accounting to algebra, biology to business studies, criminology to caring, everyone can find a course to suit their needs." 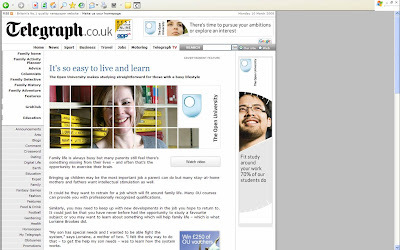 The homepage of the promotion (http://www.telegraph.co.uk/ou) links to the video content and other aspects of the promotion. It also contains a prize draw that allows readers to win £250 course vouchers, every week for the next 8 weeks. This is a great example of a traditional newspaper publisher embracing new channels, resulting in an innovative cross-media promotion for an advertiser. It will be interesting to see the results!